Priha was the official warm up pattern of Tour-de-Sock 2017. The pattern was exclusive to the registered participants of TDS until the end of race in September 2017. It’s now available as a free Ravelry download for everyone. Priha is a basic ribbed cuff down sock pattern with easy stranded stripes both in the leg and foot. Instructions are given for three stitch counts, namely 64 / 72 / 80 sts. 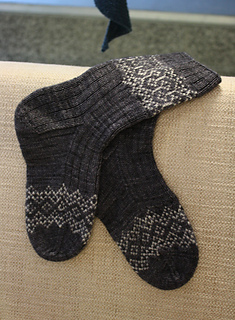 The stranded patterns are inspired by Karelian handicrafts; priha is Karelian language, meaning a youngster in English. ERRATA: Please note that in pattern ver3 there’s a mistake in the toe instructions! The ribbing should continue uninterrupted on the top of the toe (i.e. the established ribbing is continued on needle 2 throughout the toe). 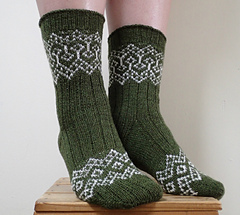 Ver4 that is downloaded on Ravelry is corrected.